Gravel provides a low-cost alternative to brick, paver or asphalt driveways but requires more maintenance and different preparation methods. To build a high quality gravel driveway that resists sinking and requires less maintenance, most people excavate and prepare the soil below the gravel driveway. However, if you live in an area with rocky, sandy or clay soil, excavating you may not have the option to excavate for your driveway. You can still build a gravel driveway without excavating by building the driveway up on the surface of the ground. Mark the location, width and lay of the driveway by outlining the driveway with wooden yard stakes. 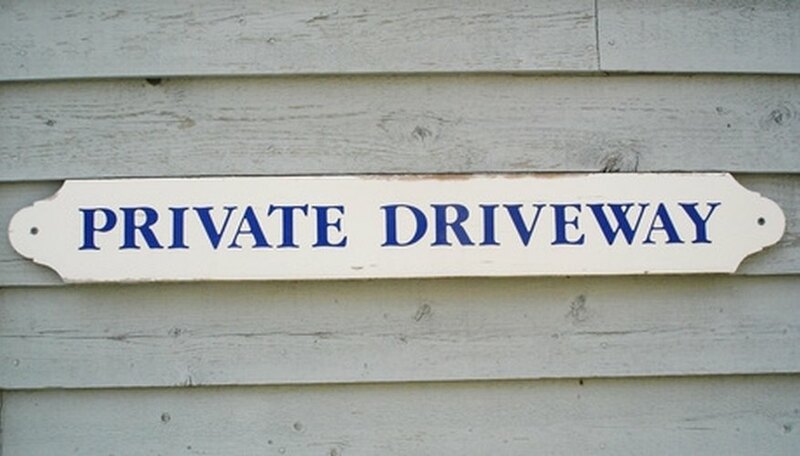 Place one stake every 6 to 10-feet along both the left and right sides of the driveway site. Tie a string or ribbon between the stakes to create a more definite outline for the driveway. Walk across the entire driveway site, from the road to your garage or home. Look for any soft or squishy ground that needs repairs before you start building the driveway. Fill soft areas or areas prone to water pooling with landscape rocks measuring roughly the size of an adult fist. Compact the soil inside the site to create a firm foundation for your gravel driveway. Run a mechanical soil compactor over the entire site until the soil stops shifting under the weight of the compactor. Dig a 12-inch wide trench along the length of the driveway. Locate this trench immediately outside the wooden stakes. You will use this trench to anchor the retaining walls on each side of the driveway that hold the gravel into place. This trench needs only to measure as deep as half the thickness of the landscaping blocks you will build the walls from. Set the first row of landscaping blocks into place inside the trench. Place the blocks end-to-end along the entire length of the driveway. After you finish the first row, continue onto the next layer, doing an entire layer of blocks at a time. You are building retaining walls along the outside of the driveway to hold the gravel into place, and must place a row or two below ground level to make the walls stronger and more durable. Apply masonry adhesive to the bottom of each new block you add to the two retaining walls on either side of the driveway site. Stagger the blocks from the previous layer to create more decorative and stronger walls. Continue adding one block at a time and build the walls up to a total height of approximately 18-inches. Stagger the blocks length-wise, keeping the vertical horizons on each side of the retaining wall perfectly vertical, without any leaning pieces or rows. Lay a six-inch layer of coarse stone into the bottom of the driveway site between the two retaining walls. Use stones measuring about the same diameter as adult fists and compact this layer of stone with the mechanical compactor until the stone layer does not shift under the weight of the compactor. Apply two three-inch layers of medium-sized gravel to the driveway site. Compact each layer with the soil compactor before proceeding. Apply a final section of fine gravel to the driveway site. Fill in two-inch layers, compacting the gravel each time with the soil compactor. Fill the driveway site flush with the tops of the retaining walls and compact the driveway a final time. Taper the ends of the driveway by removing gravel to make a slope you can easily drive your vehicle over. Taper the end by the road and the head of your driveway, as well, if you plan on taking your vehicles off the driveway in that direction.